A Few days ago we have heard that our family, brothers and sisters in Palu and Donggala Central Sulawesi was in disaster or calamity, many house and property was landed flat by tsunami and eartquakes. No exception like Ponulele Bridge in Palu. Before that happened this bridge was a curved bridge when in the world after Japan, France and Indonesia. The bridge was inaugurated by the fifth president of Indonesia Dr. H. Soesilo Bambang Yudhoyono in 2006. 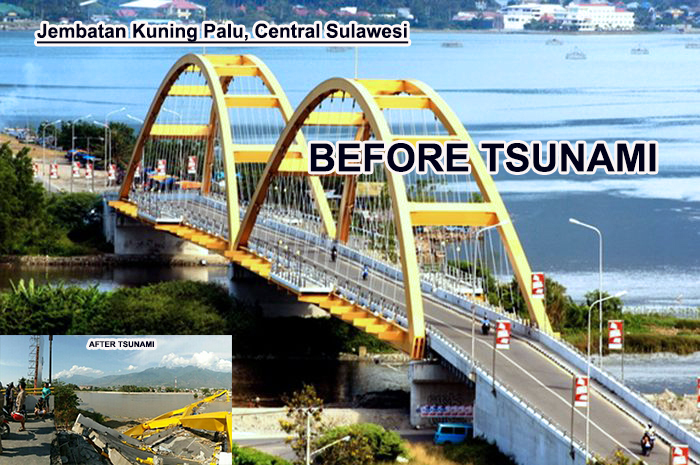 This bridge was located in Talise Bay and connceted between 2 sub regent East Palu and West Palu. The length of this bridge is 250 meters and the higher curve point is 20.2 meters from the body of bridge is 7.5 meters and The total iron surface area of the bridge: 6234.40 m2. But this Bridge is destroyed by Tsuname at 28 September 2018. How is Jalpeders? Is the info we share useful for you? We hope so. We expect your criticisms and suggestions to advance our blog. Thank you and don't forget for praying to our families in Palu.